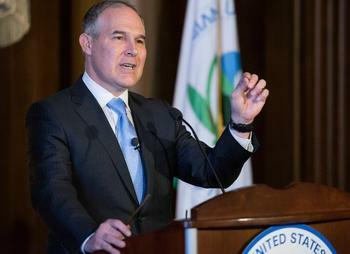 WASHINGTON, DC, February 24, 2017 (ENS) – Scott Pruitt took the helm at the U.S. Environmental Protection Agency Tuesday, with a host of problems already on his plate – an agency with which he has no experience, thousands of newly released emails showing his ties to the fossil fuel industry when he was Oklahoma attorney general, expectations from the Trump White House and the Republican Congress that he will cut back the EPA’s reach in favor of industrial development, and pressure from environmentalists ready to go to court. Pruitt will accept no over-reach, something the Republicans often complained about during the Obama presidency. Pruitt says the EPA can only do what Congress has authorized it to do. “Those that we regulate ought to know what they can expect from us,” he said. “I seek to ensure that we engender the trust of those at the state level, that those at the state level see us as partners and not as adversaries,” he said. “I think our nation has done better than any nation in the world at making sure that we do the job of protecting our natural resources, and protecting our environment, while also respecting economic growth,” said the new administrator. But Pruitt is already under pressure. He may have to wait months to have his senior leadership team in place as concern grows that he will be running a large federal agency that he does not understand, and did not attempt to understand ahead of his February 17 Senate confirmation vote, the publication “Inside EPA” reported Thursday. Among his supporters’ concerns is that, “Pruitt is believed to have selected a chief of staff, Ryan Jackson, who similarly lacks any EPA experience and has been hostile to the agency during his tenure as staff director and chief of staff to Senator James Inhofe,” an Oklahoma Republican and a well-known climate skeptic. Jackson has been Inhofe’s chief of staff since January 2011 and worked with him closely in other roles before that. In addition, Pruitt will be facing an avalanche of Republican actions seeking to rescind Obama-era protections for places like the proposed Pebble Mine on Alaska’s Bristol Bay, which supports the world’s largest sockeye salmon fishery. The fishery employs more than 14,000 and generates revenues of more than $500 million annually. Earlier this week, House Science, Space and Technology Committee Chairman Lamar Smith, a Texas Republican, asked the EPA Administrator to rescind the EPA’s 2014 decision to use Section 404(c) of the Clean Water Act to block development of what would be one of the world’s largest copper and gold mines. Canadian-owned mining company, Northern Dynasty Minerals, and its subsidiary, the Pebble Limited Partnership, have been proposing to build this mine for the past decade. She pointed out the adverse environmental impacts of developing the proposed mine in Bristol Bay. These impacts were described by the 2014 decision, which warned that the Pebble mine development could destroy up to 94 miles of salmon spawning streams. “Northern Dynasty itself has long been aware of these fatal flaws but opted to paper them over rather than fess up,” Kerrisdale reports. As EPA administrator, Pruitt faces another big problem, too – emails that show his close association with the fossil fuel industry during his tenure as Oklahoma attorney general. As a result of an Open Records Act request and lawsuit filed by the nonprofit Center for Media and Democracy, on Tuesday night the Oklahoma Attorney General’s office released more than 7,500 pages of emails and other records it withheld before Pruitt’s confirmation as EPA administrator. “There is no valid legal justification for the emails we received last night not being released prior to Pruitt’s confirmation vote other than to evade public scrutiny,” said Arn Pearson, general counsel for Center for Media and Democracy. “There are hundreds of emails between the AG’s office, Devon Energy, and other polluters that senators should have been permitted to review prior to their vote to assess Pruitt’s ties to the fossil fuel industry,” Pearson said. Later that year, Pruitt did file opposition to both the Renewable Fuel Standard and ozone limits. In a “New York Times” Pulitzer winning series in 2014, Eric Lipton exposed the close relationship between Pruitt and Devon Energy. These newly released emails reveal more of the same. In one email, Devon Energy helped draft language that was later sent by Pruitt to the Obama-era EPA about the release of the potent greenhouse gas methane from oil and gas fracking. Newly released emails from Pruitt’s time as Oklahoma attorney general show several examples where he or top officials in his office coordinated with fossil fuel groups to target EPA’s climate and air regulations, buttressing critics’ claims that the new administrator is too close with the industry he now must regulate. The release of these emails comes as Pruitt is trying to calm the fears of career staffers that he is not committed to EPA’s core mission of protecting public health and the environment. And more incriminating documents may be forthcoming. Environmentalists are bracing for four years of fighting to protect the planet. “In all, removing the many safeguards Mr. Pruitt has opposed in his career would cause up to 50,000 premature deaths, 850,000 asthma attacks, 28,000 hospital and emergency room visits, 21,000 heart attacks, and three million missed school and work days, and would eliminate $500 billion in net economic benefits, based on EPA analysis,” Thompson said. The public interest environmental law firm Earthjustice has more than 100 attorneys in offices across the country, all ready to take the Pruitt EPA to court to protect communities and the environment.